'Capacity' runs Thursday–Sunday through Sept. 18 at Main Stage West. 104 N. Main St., Sebastopol. Thursday–Saturday at 8pm; 5pm matinees on Sunday. $15-$25. 707.823.0177. THE EINSTEINS Playing opposite Sam Coughlin, Ilana Niernberger gives an outstanding performance. 'I've come unstuck in time," insists a distraught but fiery Mileva Mari Einstein, from a hospital bed in Zurich, where she's being treated for a mysterious paralysis. "The faster I move," she tells her skeptical doctor, "the slower it all goes." It is 1916, the date projected into the vast black hole hovering over the stage of Main Stage West, in Sebastopol. Suddenly and silently, the date is wiped away, as the story pitches and shifts, flowing backward, a new scene already beginning before the last one has ended. Clearly, it isn't time in which Mileva has become unstuck so much as it is memory. And so begins Rebecca Louise Miller's Capacity, a lovely, captivating exploration of the relationship between Albert Einstein (an excellent Sam Coughlin, nicely affecting the iconic Einstein look) and his first wife, Mileva (Ilana Niernberger, heartbreaking and brilliant in her best performance to date). Capacity shows us how the couple met and eventually married, while both were students of physics at Zürich Polytechnic. When an unexpected pregnancy disrupts their romantic ideals, sacrifices are made, with increasingly devastating results. Initially a union of true mental equals, Albert and Mileva's complicated romance asks whether intense genius and intense love can long exist in the same relationship, or the same person. 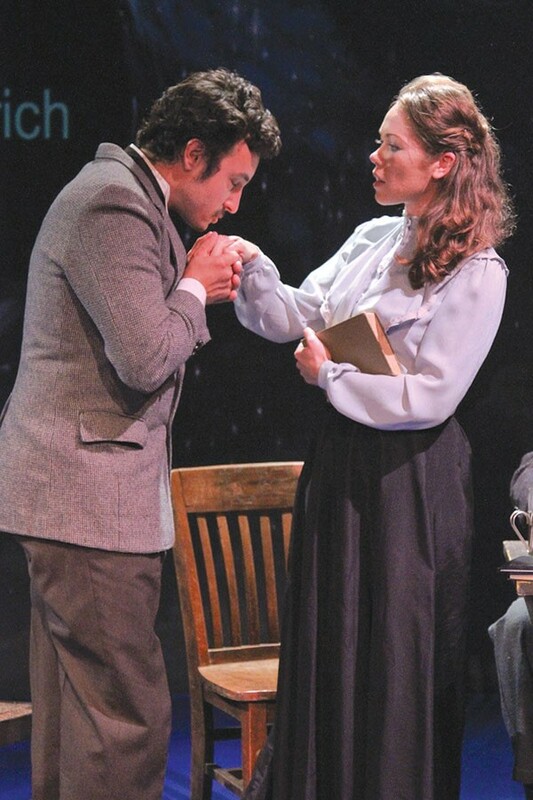 Elegantly and insightfully directed by Elizabeth and John Craven, Capacity marks MSW's second premiere from Miller. Her 2012 play Fault Lines, inspired by the 1993 murder of Polly Klaas, also debuted there. Similarly borrowing from real-life events to spin a speculative story of stunning emotional power, Miller now examines the human side of one of the most beloved figures in modern history. While Einstein's reputation as a genius survives intact, his image as an immaculate secular saint is given a devastating—and evidently deserved—takedown. As the central couple, Niernberger and Coughlin do remarkable work, eschewing accents and makeup as they bounce about in time. Effective, in numerous roles, are John Browning, Rae Quintana, Jared Wright, the latter appears as Einstein's dying father. Miller's lyrical storytelling, aided by clever scene shifting courtesy of the Cravens, is clear-eyed and beautifully crafted. Capacity casts a spell that may forever alter how we feel about Albert Einstein, while reminding us that greatness, for good or ill, is often achieved at extreme personal cost.